Arroyo Grande Neighborhood Produce Collection! On April 12th, 2013, a sunny Friday afternoon in Arroyo Grande, 8 volunteer gleaners and one GleanSLO coordinator gathered together to pick a variety of citrus fruit from 5 homes in the neighborhoods surrounding Heritage Square Park. Together with the partnership of the homeowners and volunteers, we provided 938 pounds of oranges, lemons and grapefruits to the Food Bank. 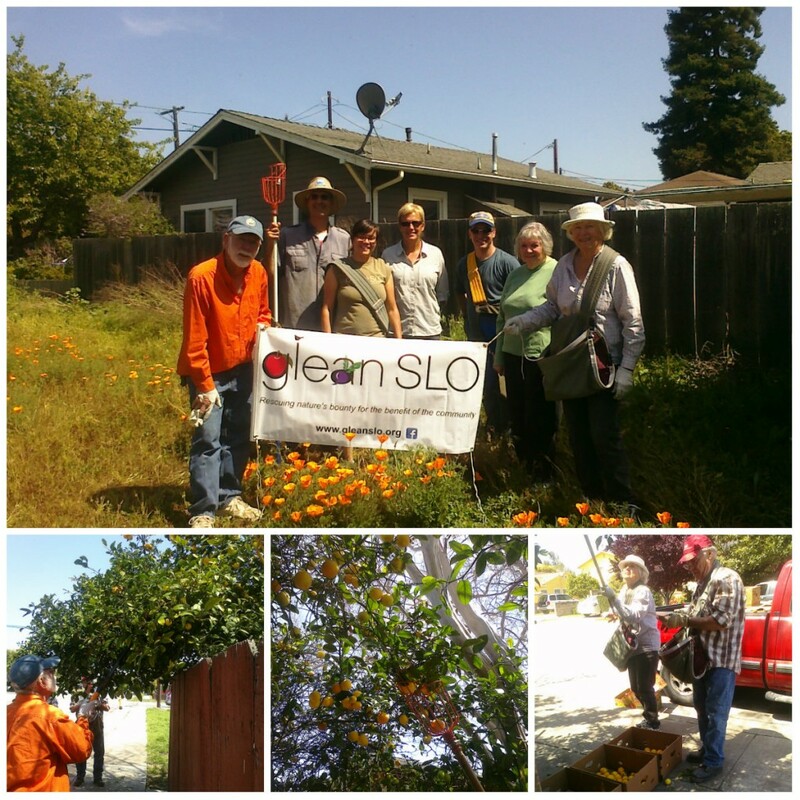 Our first Neighborhood Citrus Collection of 2013 was held in San Luis Obispo on March 2nd. 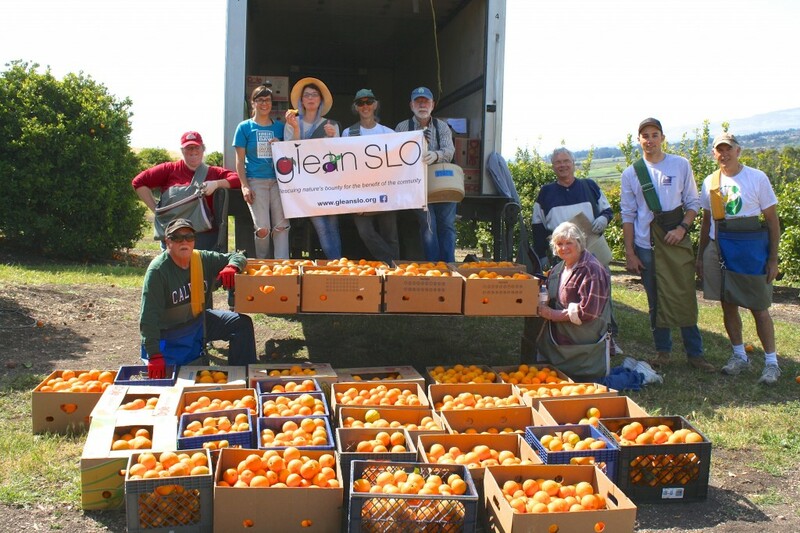 This second Neighborhood Collection was initiated and organized by volunteer and Arroyo Grande resident, Vince Petrie, who read about GleanSLO and wanted to involve his neighbors in our efforts to provide fresh, local produce to those in need. In total, Vince has referred over 10 homes and properties with fruit trees to GleanSLO. Thanks to the team of Chuck Asmus and Vince Petrie who have lead these smaller, neighborhood gleans. They have made a huge contribution to GleanSLO as they are now organizing and managing harvests on their own as Volunteer Leaders! This entry was posted in Produce Collection on 04/27/2013 by gleanslo. 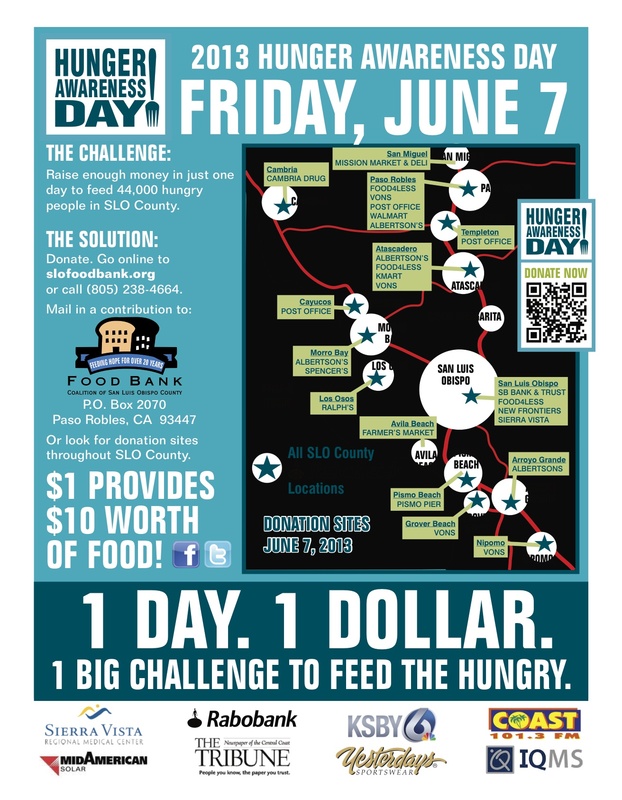 Apple Blossom One-Mile Walk Fundraiser for GleanSLO! 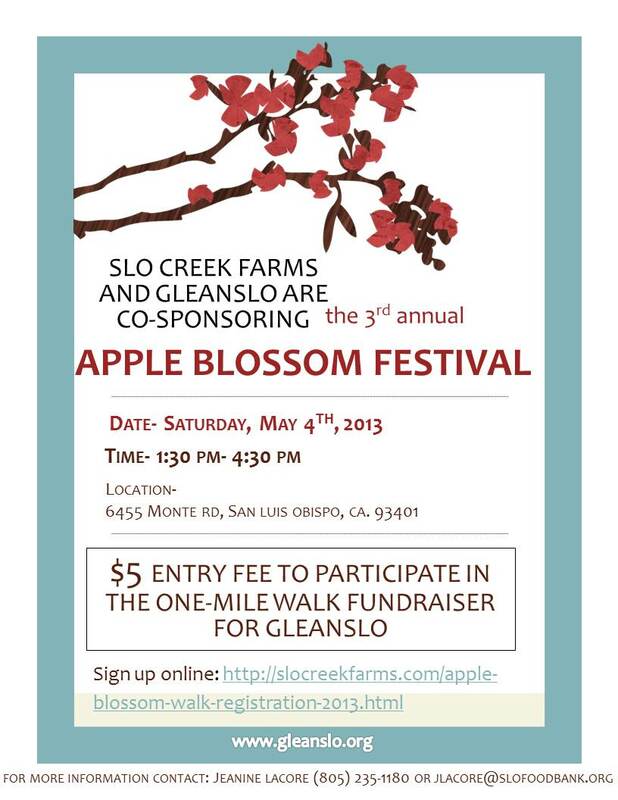 The Apple Blossom One-Mile Walk Fundraiser is $5 and the proceeds will benefit GleanSLO. Walk one mile through the beautiful orchard at your own pace, anytime during the festival. or register and pay on the day of the festival. We hope to see you there! This entry was posted in Events on 04/25/2013 by gleanslo. Save the Date! Hunger Awareness Day June 7th! This entry was posted in Events on 04/18/2013 by gleanslo. 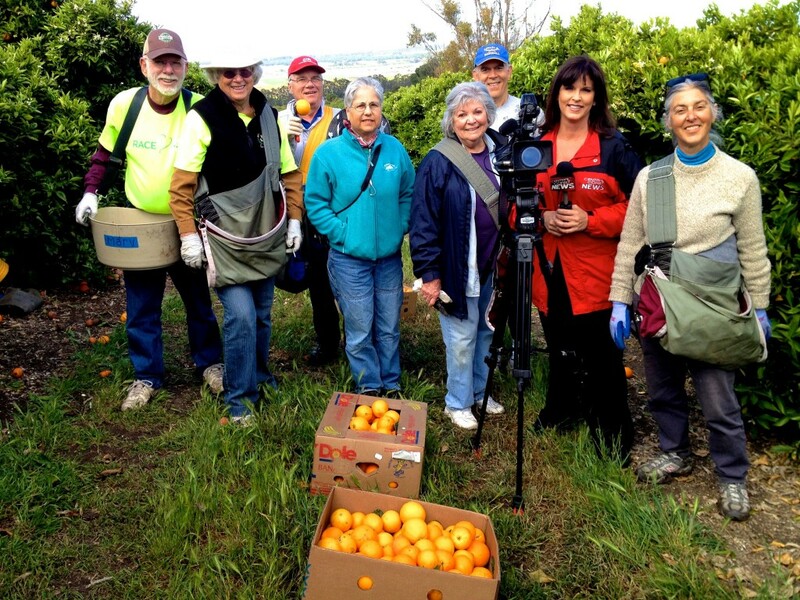 Thank you to Patti Piburn from KCOY for joining us on a glean and highlighting our work. The piece was aired today, Tuesday, April 9th, 2013 on KCOY! Growers Jacqueline and Gary Frederick generously offered their orchards to us again for an orange glean and Patti was able to capture some of what we do. Here’s Patti with our dedicated group of volunteers. Volunteers pictured here with KCOY Anchor/Reporter Patti Piburn: Marv and Pet, Bill and Alma, Merry, Chuck and Carmela. Photo by Carolyn Eicher. This entry was posted in Farm Harvests on 04/09/2013 by gleanslo. We’ve had wonderful opportunities to glean oranges and tangerines at the Frederick Farm in Nipomo. Thanks to the volunteer groups who have joined us for these harvests! This photo was taken at the April 2nd glean. All these oranges and we still picked more! To see more photos go back to our Home page and then click on the “Photos and Videos” button on the right side of the page. From there, click on the Flickr icon. We are arranging photos of our backyard/residential gleans as well as our farm gleans and farmers’ market pickups. Thanks for stopping by! This entry was posted in Farm Harvests on 04/03/2013 by gleanslo.